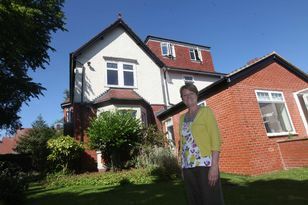 Being sent to view the wrong property turned into a happy ending for Dr Jean Adams. Househunting on their bikes, she and partner Martin stumbled upon a property for sale in Northumberland . The estate agent had accidentally sent the couple to view a different property, however Bolam Hall Cottage turned out to be the perfect choice. Dr Adams said: “We fell in love with the house as soon as we drove up the drive. We’d been house hunting on our bikes as we thought it was a good way to get to know the area. “We saw a for sale board and when I rang the estate agents they sent me the details for the wrong property. The couple bought Bolam Hall Cottage near Bolam Lake Country Park more than 10 years ago. Dating from the early 1800s, the property stands within the grounds of Bolam Hall. Surrounded by stunning countryside, the cottage has provided the perfect retreat for the outdoor loving couple. Accommodation includes a charming reception hall with stone flooring and cloakroom. The 21ft living room is a feature of the property and includes a fireplace with multi fuel stove. There is also a 19ft dining room and 17ft study/TV room also with stove. The kitchen has a hand-built kitchen and Dr Adams said: “My favourite room is definitely the kitchen. It’s a huge family space and has a four oven Aga. Upstairs there is a large master bedroom with fitted wardrobes and an en suite bathroom. There are three further double bedrooms and bathroom. According to Dr Adams, the property is perfect for families. The location of the property is a major selling point. It stands in the formal grounds of the hall, in a private estate. The property has attractive gardens which include terraced lawns, as well as a third of an acre of woodland. There is also a workshop/store and double garage with twin electric doors. Dr Adams said: “It’s a lovely rural setting, however we aren’t isolated and have amenities within easy reach. Bolam Hall Cottage, near Morpeth, is for sale through Rook Matthews Sayer at offers in the region of £650,000, tel: 01661 860228.